In Wilmington, when the oft-told story of a holiday meal becomes bogged down with facts, the newspaper happily prints the legend. Here’s the story: During the Great Depression, Cape Fear fishermen turned their trusty gigs toward the sea on Christmas Eve, trying to land a bittersweet alternative to holiday turkeys and hams they could no longer afford. The next day, The Christmas Flounder, stuffed with oysters, collards, crabs, and grits, would provide cheery sustenance, alleviating the sting of the drooping, empty stockings pinned to the hearth. If you’ve read the Wilmington StarNews on Christmas Eve, you’ve read the story. Its telling is a tradition, begun as early as 1950 in paper and ink by Paul Jennewein, who enjoyed a nearly 40-year newspaper career in Wilmington. In 1946, the Wilmington Morning Star hired Jennewein, who wrote continuously about his community until his retirement four decades later, in 1984. He dutifully served as a cultural and spiritual documentarian in his long-running “Along the Cape Fear” column. And, until his death in 2000, he was the world’s lone authority on the Christmas Flounder tradition. Jennewein found a champion in a colleague, Charles Riesz, who for years was the editorial page editor of the StarNews. It was Riesz’s paean to the tradition — published annually for more than 30 years and counting — that gave birth to the Clement C. Moore-inspired intro. Riesz, a hard-boiled newshound with a soft spot for whimsy, wrote this enduring editorial. And so it came about that one Christmas Eve in the reign of Franklin the King for Four Terms, the merry glow of kerosene lanterns and — for those who could afford the Ray-O-Vacs — flashlights gleamed over the waters of the sound. There was just one problem: Hardly anybody had any recollection of Christmas flounders, stuffed or otherwise. The Truth — that’s with a capital “T” — is a sacred thing to journalists. But The Facts — a different beast altogether — merely cloud this story. For modern readers with strong Google skills, The Facts are but a few clicks away. But in Jennewein’s obituary, published August 5, 2000, in the Wilmington Morning Star, Agnes Blum, a colleague to both Jennewein and Riesz, betrayed the men’s efforts to speak The Truth. The Christmas Flounder was a patchwork of whole cloth, stitched straight from the rich loom of Jennewein’s mind. But make no mistake — The Facts in no way tarnish The Truth. The Flounder’s draw was so strong that, almost immediately, newly christened believers began writing in to proclaim their faith. Some shared their own experimental recipes. Others corroborated the falsehood with equally compelling narratives of their own fabricated childhood memories. Over the years, other publications have raised a toast to The Great Fish, as well, often none the wiser to The Flounder’s murky origin story. Competing magazines around Wilmington have given a straight-faced nod, and former Charlotte Observer Associate Editor Jack Betts (who was fully in the know) printed Riesz’s tribute on his own hallowed pages, earning the legend statewide recognition. 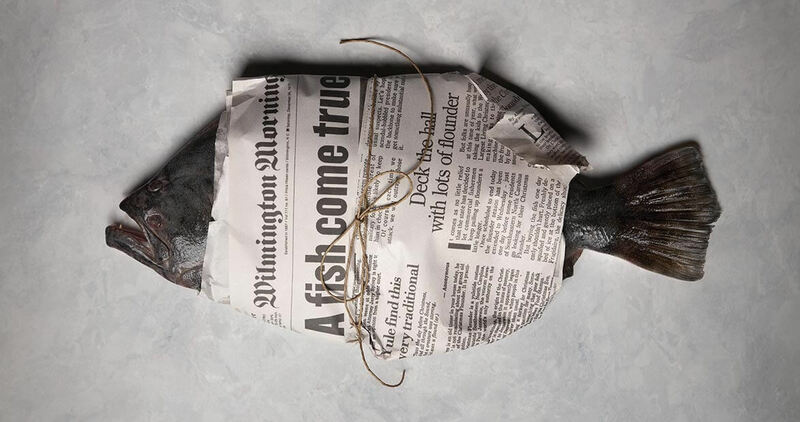 The same obituary that provided the condemning evidence against The Christmas Flounder also shined a light on its origins. Virginia (most knew her as Ginnie) noted that her husband’s fable began with a factual observation: He did witness fishermen gigging for flounder on Christmas Eve. “He said, ‘They’re getting their Christmas flounder,’ ” she told the reporter. Riesz, long a believer, defends The Truth of The Christmas Flounder to this day, The Facts be damned. More recently, several chefs on the coast have taken up The Christmas Flounder, either serving an interpretation in their restaurants, or providing recipes to food writers across the Cape Fear area. It could be said that The Christmas Flounder has never been more alive; Jennewein’s off-the-cuff stab at filling column inches two generations ago has now been made true. As for myself, currently serving as a food writer at the StarNews, faith has been a gradual thing. In my earliest days as a journalist, with an unwavering collegiate loyalty to by-the-books reporting coursing through my veins, I merely wrote off The Great Fish. Today, I’ve gotten a lot better at swimming upstream, learning to see The Truth in spite of The Facts. And this I can say, without a moment’s hesitation: Yes, North Carolina, there is a Christmas Flounder. Paul Stephen has worked as a photographer and reporter for the Wilmington StarNews since 2004.